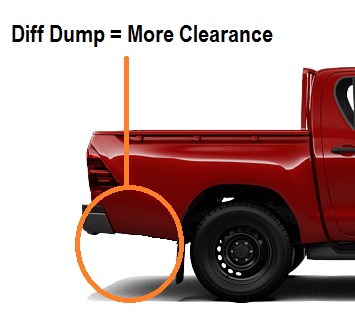 What actually is a diff dump exhaust? Exactly what does the ‘Diff Dump’ exhaust kit mean? Well typically every OEM exhaust will run over the rear axle and terminate after the rear wheels. 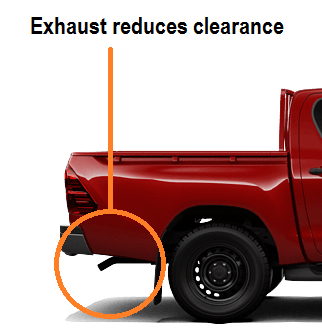 The ‘Diff Dump’ exhaust essentially terminates at the Diff and dumps the exhaust towards the ground so the exhaust gas doesn’t blow up into the underbody of the vehicle. Rhino Exhaust Diff Dumps are available as a complete turbo back system [3inch] or as a muffler eliminator [mostly 2.5inch] replacement to the existing exhaust system. Rhino Exhaust has a massive range of Muffler Eliminator Diff Dump Exhausts. We have kits to suit the Toyota Hilux, Holden Colorado, Ford Ranger and the Mitsubishi Triton – with more coming soon! Check out the range and the options available using the vehicle finder on our website to find your best options.